Up on the chopping block today is the Winter 07 issue of Knitter's Magazine. The key phrase is buried treasure. If Interweave Knits makes good use of the Internet, Knitter's is not quite there yet. Their e mail newsletter is deeply buried in their website, and their printed "Online" column, in this issue at least, has no relation to the World Wide Web. A single editorial page called "The Knitting Universe.com," advertises the magazine's web site and another, an Internet directory, is an ad for online knitting-related businesses disguised as editorial content. The website itself is colorful if a bit jumbled looking. Here are a few good features - an index of the first 59 issues, a bunch of free patterns, and articles on knitting techniques, but you really have to dig to find them. The most prominent content is advertising for their generally excellent publications and for their expensive Stitches conferences. They must make a lot of money from these if placement is any indication. It's like they don't care much about the really useful features their website offers. Or are their readers not Internet friendly? 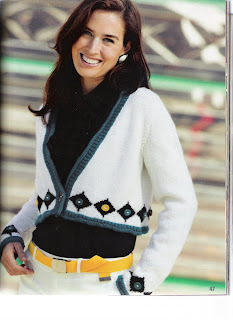 Last post I noted that the editorial content of Interweave Knits was thin. Well compared to Knitter's, Interweave should go on a diet. Apart from the features mentioned above, there is a smarmy article naming the knitter of the year (who actually does a lot for charity, but the writing and presentation stinks), unfocused reportage about trends as unveiled at an Italian knitwear show, and a major profile of the Berroco yarn company. None of this is helpful or even that interesting, and the Berroco article is dicey, although no Berroco ads appear in the magazine. In keeping with the theme of buried treasure, however, there is one gem that appears in every issue of Knitter's magazine. That is a column by my idol, Perri Klass. Perri is a physician, family woman, knitter, novelist, and non-fiction writer. If she is as good at everything else as she is at writing, she scares me. She always finds meaning in knitting and its aspects. Her book, written with her mother, Every Mother is a Daughter, while not about knitting, was one of my favorite non-fiction audio-reads. I recommend it for reading while knitting. This issue's column is about Perri trying to work knitting into a novel she wrote. 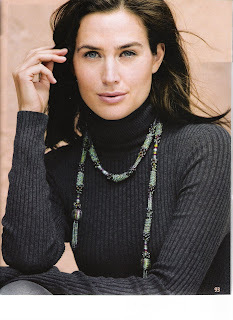 The Winter 2007 issue of Knitter's contains 25 patterns. Of these 14 are for sweaters, 6 are for scarves (including 3 dickeys and 1 wrap), there are 2 each of hats and necklaces, and 1 jumper- dress. You can somewhat follow along with the reviews on line, but since there is no gallery, you can't see all of the patterns. Who would wear this? OK, granted, this is the worst of the bunch. It is called Prairie Patterns by Angela Juergens. But Media Man with its ridiculous zippers and pockets and Boxes and Bands with its loud stripes are almost as bad. Best of the bunch is the Kaffe derivative Meridian by Barry Klein which makes clever use of slip stitch patterning. But knit it for a woman. I don't see this on a man (although the model looks hot in it). 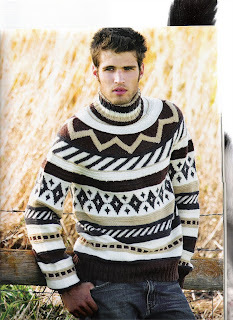 In general, the men's patterns look like they were designed by a granny who is high on meth. I can't help but wonder, are Knitter's patterns too old, even for a person of advanced years such as myself. That would seem to be the case looking at the patterns above and taking into account others from this issue such as the dull and baggy pullover Radiant Diamonds and the frumpy cardigan Honey Gold. This is Chased Silver by Sandi Rosner which makes subtle use of asymmetry in a two part design with an interesting under layer. Made longer, the over sweater would work on its own. Worst of Knitter's: Prairie Patterns and Teal We Meet Again (which also wins worst name). Best: Chased Silver and Beaded Lariats. Knitter's has been edited by Rick Mondragon since the Summer 2001 issue. Before that Rick was a designer (Winter 99), photo stylist (Winter 00), and assistant editor (Spring 01). He might have needed a longer apprenticeship. I am not saying that the mag as gone steadily down hill since Rick replaced Nancy J. Thomas as editor, but I am flirting with saying that. Knitter's still occasionally runs patterns that I want to knit, but they used to run a lot of them. Do you agree? Disagree? Weigh in with your comments. I agree with you 100%. It makes me sad to consider giving up on Knitter's after so many years of faithful reading, but the pickings are awfully slim. The last good technical article I saw there was in 2005 (by Maureen Mason-Jamieson). I really don't see the point of the recent influx of articles about various family "dynasties". In both features and patterns,The Mondragon years are taking their toll. Re: use of the web, XRX was actually ahead of the curve when it started the listserv KnitU in the late 90's. It is still a pretty good listserv even though with blogs and Ravelry its days may be numbered. Thank you for the reinforcement. It would be hard for me to give up on Knitter's since I have been with them for so long, but I might do it. I had forgotten their early use of the Internet, and I'm glad you mentioned it. But I don't think they've kept up. "Teal We Meet Again" resembles quite strikingly a sweater I knit in the late 60's. More out of date than you thought, eh? Knitters magazine really is a disaster. What a shame. I like your magazine reviews. You are pretty frank about what appeals to you and that is refreshing. I have subscribed to Knitters for only a year now and I don't think I'll renew. I get so little useful information and the patterns don't make me want to knit them. Who are these people who would wear such clothing? They are not in my world! Thanks for your comment Marie. I wish you had seen Knitter's in the late 90s when it was, in my opinion, a much better publication. I keep hoping they'll get back to that. You are right on. Knitter's is a train-wreck. It makes me sad to compare the issues of Knitter's that I saved from the mid to late 90s with the garbage they are putting out know. It used to be my favorite magazine by far, but I let my subscription lapse a few years ago. I still look at it at the bookstore to see if it's worth buying, but more often than not, I put it back on the shelf and walk away. You are so right, Anon. ; it is sad. Knitters definitely used to be the best all aroung knitting magazine, although I have always liked Vogue. If it werent't for my compulsive knitting magazine collecting habit, I rally would cancel my subscription. But I also keep waiting for them to leave the Mondragon years behind and improve.